For other uses, see Bruise (disambiguation). "Black and blue" redirects here. For other uses, see Black and Blue (disambiguation). A bruise, also known as a contusion, is a type of hematoma of tissue in which capillaries are damaged by trauma, causing a localized internal bleeding that extravasate into the surrounding interstitial tissues. Most bruises are not very deep under the skin so that the bleeding causes a visible discoloration. The bruise then remains visible until the blood is either absorbed by tissues or cleared by immune system action. Bruises, which do not blanch under pressure, can involve capillaries at the level of skin, subcutaneous tissue, muscle, or bone. Bruises are not to be confused with other similar-looking lesions primarily distinguished by their diameter or causation. [clarification needed] These lesions include petechia (< 3 mm result from numerous and diverse etiologies such as adverse reactions from medications such as warfarin, straining, asphyxiation, platelet disorders and diseases such as cytomegalovirus), purpura (3 mm to 1 cm, classified as palpable purpura or non-palpable purpura and indicates various pathologic conditions such as thrombocytopenia), and ecchymosis (>1 cm caused by blood dissecting through tissue planes and settled in an area remote from the site of trauma or pathology such as periorbital ecchymosis, e.g.,"raccoon eyes", arising from a basilar skull fracture or from a neuroblastoma). As a type of hematoma, a bruise is always caused by internal bleeding into the interstitial tissues which does not break through the skin, usually initiated by blunt trauma, which causes damage through physical compression and deceleration forces. Trauma sufficient to cause bruising can occur from a wide variety of situations including accidents, falls, and surgeries. Disease states such as insufficient or malfunctioning platelets, other coagulation deficiencies, or vascular disorders, such as venous blockage associated with severe allergies can lead to the formation of purpura which is not to be confused with trauma-related bruising/contusion. If the trauma is sufficient to break the skin and allow blood to escape the interstitial tissues, the injury is not a bruise but bleeding, a different variety of hemorrhage. Such injuries may be accompanied by bruising elsewhere. A woman's bruising after a severe fall. Bruises often induce pain immediately after the trauma that results in their formation, but small bruises are not normally dangerous alone. Sometimes bruises can be serious, leading to other more life-threatening forms of hematoma, such as when associated with serious injuries, including fractures and more severe internal bleeding. The likelihood and severity of bruising depends on many factors, including type and healthiness of affected tissues. 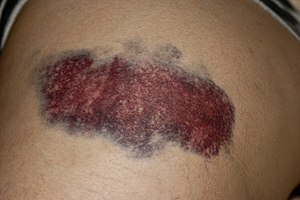 Minor bruises may be easily recognized in people with light skin color by characteristic blue or purple appearance (idiomatically described as "black and blue") in the days following the injury. The presence of bruises may be seen in patients with platelet or coagulation disorders, or those who are being treated with an anticoagulant. Unexplained bruising may be a warning sign of child abuse, domestic abuse, or serious medical problems such as leukemia or meningoccocal infection. Unexplained bruising can also indicate internal bleeding or certain types of cancer. Long-term glucocorticoid therapy can cause easy bruising. Bruising present around the navel (belly button) with severe abdominal pain suggests acute pancreatitis. Connective tissue disorders such as Ehlers-Danlos syndrome may cause relatively easy or spontaneous bruising depending on the severity. During an autopsy, bruises accompanying abrasions indicate the abrasions occurred while the individual was alive, as opposed to damage incurred post mortem. Bruise shapes may correspond directly to the instrument of injury or be modified by additional factors. Bruises often become more prominent as time lapses, resulting in additional size and swelling, and may grow to a large size over the course of the hours after the injury that caused the bruise was inflicted. As stated above, bruising present in a different location than the site of impact is called ecchymosis and generally occurs when the tissue at the site of injury is loose, allowing blood to travel under the skin to another location due to gravity or other forces, such as in a black eye. Age: elderly skin and other tissues are often thinner and less elastic and thus more prone to bruising. Gender: More bruising occurs in females due to increased subcutaneous fat. Skin tone: Discoloration caused by bruises is more prominent in lighter complexions. Diseases: Coagulation, platelet and blood vessel diseases or deficiencies can increase bruising due to more bleeding. Location: More extensive vascularity causes more bleeding. Areas such as the arms, knees, shins and the facial area are especially common bruise sites. Forces: Greater striking forces cause greater bruising. Genes: Despite having completely normal coagulation factors, natural redheads have been shown to bruise more, although this may just be due to greater visibility on commonly associated lighter complexion. Bruises can be scored on a scale from 0-5 to categorize the severity and danger of the injury. The harm score is determined by the extent and severity of the injuries to the organs and tissues causing the bruising, in turn depending on multiple factors. For example, a contracted muscle will bruise more severely, as will tissues crushed against underlying bone. Capillaries vary in strength, stiffness and toughness, which can also vary by age and medical conditions. Low levels of damaging forces produce small bruises and generally cause the individual to feel minor pain straight away. Repeated impacts worsen bruises, increasing the harm level. Normally, light bruises heal nearly completely within two weeks, although duration is affected by variation in severity and individual healing processes; generally, more severe or deeper bruises take somewhat longer. Severe bruising (harm score 2–3) may be dangerous or cause serious complications. Further bleeding and excess fluid may accumulate causing a hard, fluctuating lump or swelling hematoma. This has the potential to cause compartment syndrome in which the swelling cuts off blood flow to the tissues. The trauma that induced the bruise may also have caused other severe and potentially fatal harm to internal organs. For example, impacts to the head can cause traumatic brain injury: bleeding, bruising and massive swelling of the brain with the potential to cause concussion, coma and death. Treatment for brain bruising may involve emergency surgery to relieve the pressure on the brain. Damage that causes bruising can also cause bones to be broken, tendons or muscles to be strained, ligaments to be sprained, or other tissue to be damaged. The symptoms and signs of these injuries may initially appear to be those of simple bruising. Abdominal bruising or severe injuries that cause difficulty in moving a limb or the feeling of liquid under the skin may indicate life-threatening injury and require the attention of a physician. Increased distress to tissue causes capillaries to break under the skin, allowing blood to escape and build up. As time progresses, blood seeps into the surrounding tissues, causing the bruise to darken and spread. Nerve endings within the affected tissue detect the increased pressure, which, depending on severity and location, may be perceived as pain or pressure or be asymptomatic. The damaged capillary endothelium releases endothelin, a hormone that causes narrowing of the blood vessel to minimize bleeding. As the endothelium is destroyed, the underlying von Willebrand factor is exposed and initiates coagulation, which creates a temporary clot to plug the wound and eventually leads to restoration of normal tissue. During this time, larger bruises may change color due to the breakdown of hemoglobin from within escaped red blood cells in the extracellular space. The striking colors of a bruise are caused by the phagocytosis and sequential degradation of hemoglobin to biliverdin to bilirubin to hemosiderin, with hemoglobin itself producing a red-blue color, biliverdin producing a green color, bilirubin producing a yellow color, and hemosiderin producing a golden-brown color. As these products are cleared from the area, the bruise disappears. Often the underlying tissue damage has been repaired long before this process is complete. Treatment for light bruises is minimal and may include RICE (rest, immobilize, cold, elevate), painkillers (particularly NSAIDs) and, later in recovery, light stretching exercises. Particularly, immediate application of ice while elevating the area may reduce or completely prevent swelling by restricting blood flow to the area and preventing internal bleeding. Rest and preventing re-injury is essential for rapid recovery. Very gently massaging the area and applying heat may encourage blood flow and relieve pain according to the gate control theory of pain, although causing additional pain may indicate the massage is exacerbating the injury. As for most injuries, these techniques should not be applied until at least three days following the initial damage to ensure all internal bleeding has stopped, because although increasing blood flow will allow more healing factors into the area and encourage drainage, if the injury is still bleeding this will allow more blood to seep out of the wound and cause the bruise to become worse. In most cases hematomas spontaneously revert, but in cases of large hematomas or those localized in certain organs (e.g., the brain), the physician may perform a puncture of the hematoma to allow blood to exit. Folk medicine, including ancient medicine of Egyptians, Greeks, Celts, Turks, Slavs, Mayans, Aztecs and Chinese, has used bruising as a treatment for some health problems. The methods vary widely and include cupping, scraping, and slapping. Fire cupping uses suction which causes bruising in patients. Scraping (Gua Sha) uses a small hand device with a rounded edge to gently scrape the scalp or the skin. Another ancient device that creates mild bruising is a strigil, used by Greeks and Romans in the bath. Archaeologically there is no precedent for scraping tools before Greek archaeological evidence, not Chinese or Egyptian. ^ Harrison's Principles of Internal Medicine (17th ed.). McGraw-Hill Professional. 2008. ^ Kinnaman, Karen; Binder, William; Nadel, Eric; Brown, David (2015). "Petechiae, anemia, and throbocytopenia". The Journal of Emergency Medicine. ^ Lotti, Torello (January 1994). "The Purpuras". International Journal of Dermatology. doi:10.1111/j.1365-4362.1994.tb01483.x. ^ Gumus, Koray (30 May 2007). "A child with racoon eys masquerading as trauma". Int Ophthalmol. 27: 379–381. doi:10.1007/s10792-007-9089-y. PMID 17534581. ^ Turley, Lois (2004-03-10). "Shiners-dark circles & swollen eyes". Archived from the original on 2009-12-12. Retrieved 2009-10-08. ^ "UCSF Purpura Module" (PDF). ^ Liem, Edwin B.; Hollensead, Sandra C.; Joiner, Teresa V.; Sessler, Daniel I. (2006). "Women with Red Hair Report a Slightly Increased Rate of Bruising but Have Normal Coagulation Tests". Anesthesia & Analgesia. 102 (1): 313–8. doi:10.1213/01.ANE.0000180769.51576.CD. PMC 1351323. PMID 16368849. ^ Voorhees, Benjamin W. (2007-08-31). "Medical Encyclopedia – Bruise healing". Retrieved 2007-09-09. ^ "WebMD article on bruising". Wikimedia Commons has media related to Hematomas. Look up bruise, contusion, or ecchymosis in Wiktionary, the free dictionary.